February 18, 2015, 4:43 p.m. Outgoing Attorney General Eric Holder has called for a temporary halt to all executions across the country, at least until the Supreme Court can consider whether or not certain methods of execution are unconstitutional. The federal government has already informally called a halt to executing federal prisoners while a review is conducted, but some states are continuing to execute prisoners despite the significant legal issues that now surround the practice. Until 2011 executions using sodium thiopental had been regarded as legally sound, but a European embargo on providing materials which assist executions have left states improvising how to conduct executions, leading to a botched execution in Oklahoma last year. YouGov&apos;s latest research shows that young Americans are much more skeptical of the death penalty than their elders. 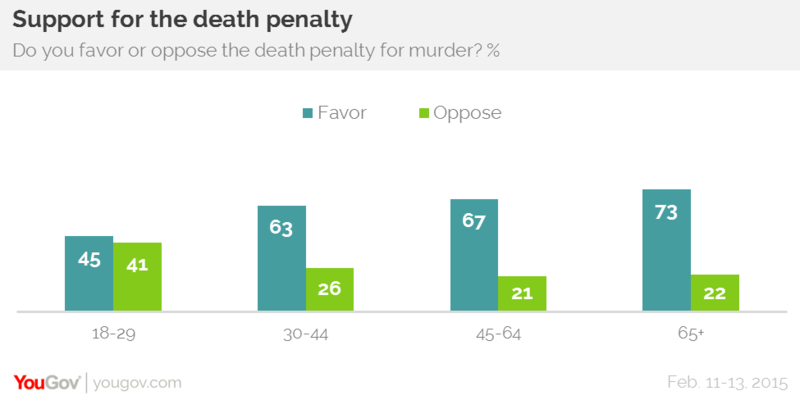 Among under-30s opposition (41%) to the death penalty is nearly level with support (45%). Most Americans in every age group over the age of 30 support the death penalty, with national support for executing murderers standing at 63% and opposition at 27%, little changed from November 2013 when 66% supported and 24% opposed the death penalty. Despite the ongoing controversy over the validity of continuing to execute inmates using lethal injections, most Americans are still convinced that the lethal injection is not a &apos;cruel and unsual punishment&apos;. The Constitution prohibits states or the federal government from imposing cruel and unusual punishments on people convicted of crimes. In fact, even though 27% oppose the death penalty only 18% believe that the lethal injection is a cruel and unusual punishment. Most Americans regard every other common form of execution as cruel and unusual, with the gas chamber (52%) being the least and beheading (81%) the most likely to be regarded as cruel and unusual.